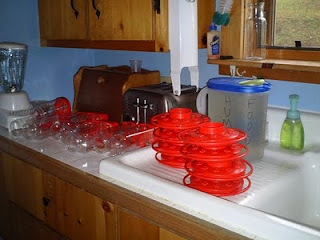 Lee has pulled out all her hummingbird feeders to prepare for the hummingbird season. They using show up May 1st, but she has seen them as early as the 27th of April. Lee starts with a couple of feeders partially filled for the early male arrivals. By the end of May all the feeders will be up and full and she will be going through that pitcher everyday sometimes feeding as much as a gallon of syrup a day. Males come first and stake out the territory. The females will come a couple weeks later. The sound of them zooming past our heads like bottle rockets lets us know winter is definitely behind us. Many of the camps have trouble with the bears stealing their feeders. I think the sound of dogs inside the cabin keeps that problem away from us. The bears are out catching up on eating. The bears love to get into any bird seed or garbage they can find. It seems when they find a good source of food they will often mark an area by scratching on a tree, post, or cabin. This doesn't make cabin owners too happy. I solved the problem at one camp by putting up electric fence on a corner the bear liked to destroy. Not feeding the bears or birds really cuts back on this activity. I will let you know when we spot the first hummingbird as two feeders are going up today. 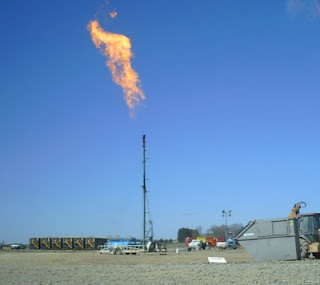 The biggest news in this area since I was born is the emerging gas well business. 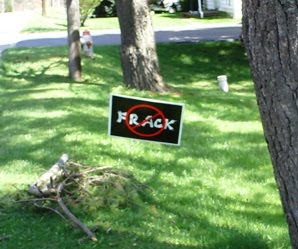 As you can see from a sign posted in a yard in Wellsboro the "Fracking" which is a method of pumping water and chemicals into shale to get the gas out has been met with some opposition. 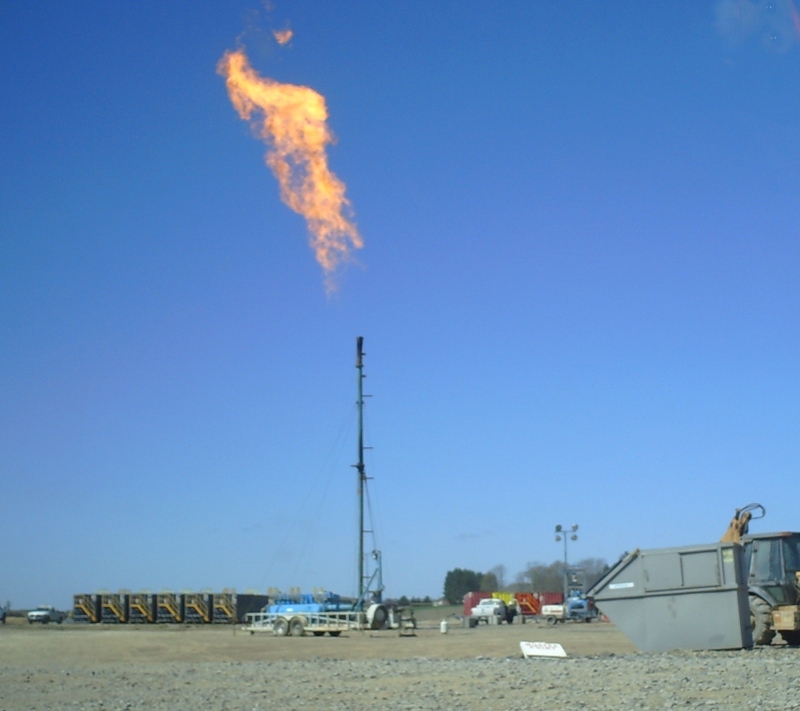 The down side of gas exploration is immediately obvious. Constant truck traffic 24/7 destroying roads, noisy drilling and a complete disruption of the recreational seclusion this area has enjoyed. The upside, "money". Money for people drilling and landowners lucky enough to have a lease and drilling supplying them with the kind of money never seen in these hills. I don't blame anyone for taking the money. It is hard making a living here. People work twice as hard for half as much and most live below the poverty line. Seeing the sky glowing at night from the gas wells gives me an eiry apocalyptic feeling. Meeting truck after dusty truck on the roads and seeing our roads posted with signs like in the third picture...makes it seem like an industrial zone. 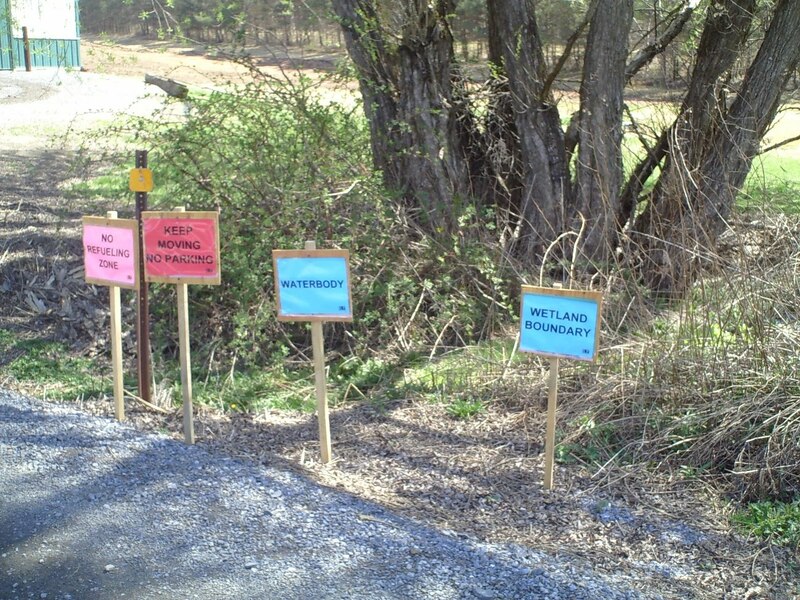 The signs say: No refueling zone, Keep moving no parking, waterbody and wetland boundry. When they first popped up we all wondered who they were for. Could we not stop? Or need to know where the water is? 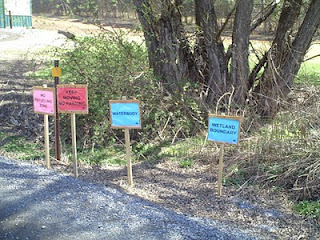 I am not sure if the gas company puts these up or the DEP, but hopefully it will help protect some of the area from spills in bad places. Just when you think you know how to get somewhere you will likely be met with the last sign. Road Closed. Here a road closed can mean a 20 mile detour so it is not a welcome sign. I have to say..I am bad and ignore the signs until someone tells me in person otherwise. So far, that has not happened. 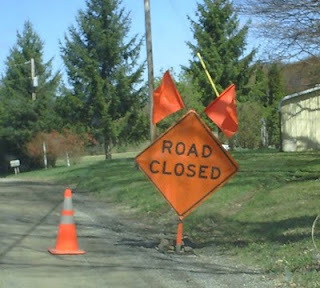 I think they forget to take the signs down when they are done with whatever they think the road needs to be closed for. This is just the beginning as the State has started to lease some forest. Nothing near us yet, but it is coming. If the sign changes to forest closed...the mountain girl will not be a happy girl. Well, a small sample of what your camp will be like this year. Grin and bear it. Lets hope when it is over the area has benefited more then it has been sucked dry. Thanks to Fred, Fran's nephew for sending me this picture. Fran is standing next to her sister, Norma and is the last one in the row to the right. 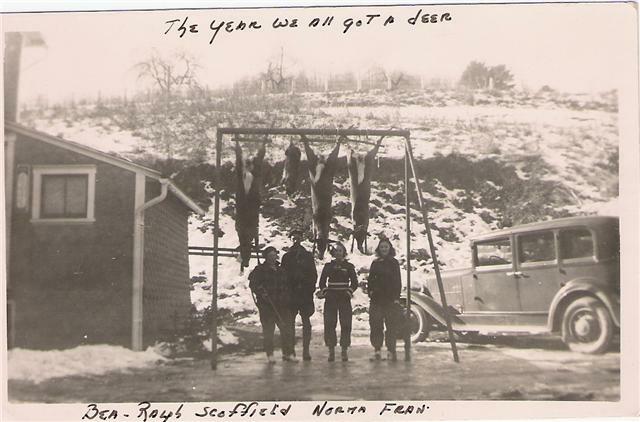 Fran was quite proud of getting this deer and had fond memories of the hunt. I know she would love being remembered in this way in the prime of life...enjoying the outdoors of Leetonia. You would hardly recognize the area from this picture as heavy logging had eliminated most of the trees. Today the area is heavily forested. 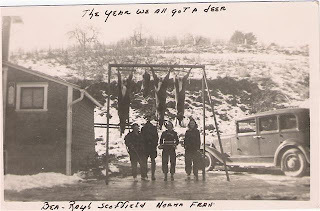 I think the deer hanging rack used here is still at the Herre camp. It is in a different spot but looks the same. Thanks again to Fred for sending me this remembrance of Fran. One of the first trees to bloom in the forest is the Fire Cherry. As you can see the other trees are just beginning to open buds. In a couple of weeks much will change in the woods. Now you can see across the mountains through the trees. As the leaves come out the sun will disappear and the woods will once again be cloaked in its summer gear. Spring Trout season starts Saturday and the following week will be gobbler season. I have seen many a gobbler out with hens since we have had such warm weather. It is amazing how many turkeys you will see right up to the day before hunting season. Then mysteriously they all disappear. Is it the first shot in the air or some sort of Turkey psychic ability, I will never know. I am back from working in California for a month as work here dried up for me during this winter. I have a few projects to do then some temporary work for the census. Hopefully, things will loosen up this year and people will do more than just repairs. I haven't adjusted to the time change yet. It takes me a few weeks to make up 3 hours. But I am enjoying being on firm ground. We had multiple earthquakes. All stemming from a 7.2 a hundred miles away from San Diego. I was hanging ceramic tile at the time of the first hit and I wasn't sure it was staying up. I made a beeline off the porch and away from the building. The worst part is it doesn't stop for some time. There were four more after shocks within an hour and at least one a day for 5 days until I left. I don't like earthquakes. I would much rather deal with snow storms, wind storms, tornadoes, you can get away from them. But there is no escaping an earthquake. I am glad to be back in Leetonia away from the hoards of people and the moving ground. I feel like I missed much of winter and I am trying to catch up with the fact it is Spring. I am sure the birds and the bugs will remind me. Mountain girl, Paula, logging off. This year brings an end to another Leetonia favorite of mine, Fran Wiegley. She passed on the end of March and even though in her late 80's watched the blog faithfully. If I went as long as I have this year without a post, I would surely be admonished and/or worried about by Fran. Although, I never met her in person, the common love of Leetonia made for sad news of her passing. I have been looking for the picture she sent of me in her hunting outfit and have been unable to find it. But if I do it will definitely be posted. 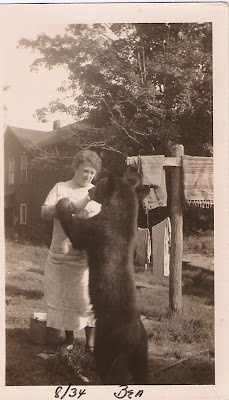 This picture is of her mother in Leetonia, August of 1934 bottle feeding a bear. She was the daughter of Norman and Beatrice Ottman who moved to Leetonia after the crash in 29'. My understanding was that they lived in the "Square Camp", which I believe to be the older Cassel place which is Red. Her dad was able to live rent free and she believes he feed them mostly with free deer meat. Later on he worked at the CCC camp in a manager position. Another soul is walking the streets and woods of Leetonia. I'm sure I will see her soon. Mountain girl, Paula, logging off.